When you hear about the biological processes that influence climate and the environment, such as carbon fixation or nitrogen recycling, it’s easy to think of them as abstract and incomprehensibly large-scale phenomena. Yet parts of these planet-wide processes are actually driven by the tangible actions of organisms at every scale of life, beginning at the smallest: the microorganisms living in the air, soil, and water. So, if you want to understand how an ecosystem – be it a tropical forest, an agricultural zone, or a watershed – will fare in the face of natural and human-induced changes, you need to understand what the microbes in that community are up to. But how do you examine the roles that a diverse group of creatures play if you can’t even see them without a microscope? The best way to do this is to look at their genes, and researchers from Lawrence Berkeley National Laboratory (Berkeley Lab) have developed a new DNA analysis technique that reveals a very interesting, and previously hard-to-study, aspect of a microbial community’s genome. 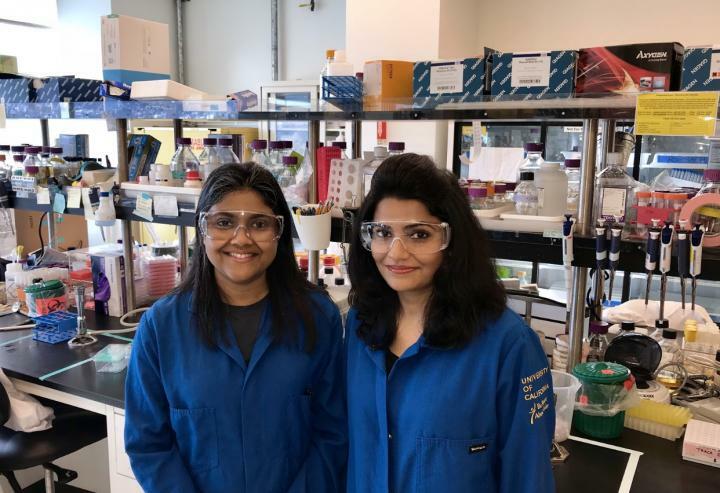 As described in the journal mBio, a team led by Aindrila Mukhopadhyay has optimized existing methods to isolate plasmids – the small packages of DNA that enable microorganisms like bacteria to quickly acquire and share genes. Often, these DNA molecules, which are separate from the chromosomes, encode functions that can confer a survival advantage in certain situations. “When you want to learn about a microbial community, focusing specifically on their plasmids allows you to get a sense of the suite of capabilities that a community wants to keep mobile perhaps because they are needed periodically,” said Mukhopadhyay, a senior scientist in Berkeley Lab’s Biological Systems and Engineering Division. And because a microbial community’s collection of plasmid-based genes, aptly called the plasmidome, changes in response to evolutionary pressure much faster than chromosomal genes, looking at this combined pool of genetic information helps scientists construct a vivid picture of the environment beyond that moment in time. After refining their approach, the scientists applied it to groundwater samples from different wells at the Oak Ridge Field Research Center (ORFRC), a site that is contaminated with heavy metals. Scientists working with ENIGMA – a multi-institute research consortium focused on advancing our fundamental understanding of complex microbial communities – conduct many studies using the unique ORFRC site. This work was a highly collaborative effort between Berkeley Lab researchers and groups at ORFRC and the DOE Systems Biology Knowledgebase (KBase). The other contributing authors on this study are Yu-Wei Wu, John-Marc Chandonia, Marimikel Charrier, Lara Rajeev, Andrea Rocha, Dominique Joyner, Terry Hazen, and Steven Singer. The work was conducted as part of ENIGMA, a multi-institute research consortium focused on studying the impact of microbial communities on their ecosystems. ENIGMA is led by Berkeley Lab and funded by the Department of Energy’s Office of Science.